Researchers found that under the ice-encrusted surface of Enceladus, the icy moon that orbits Saturn, lays a massive ocean. 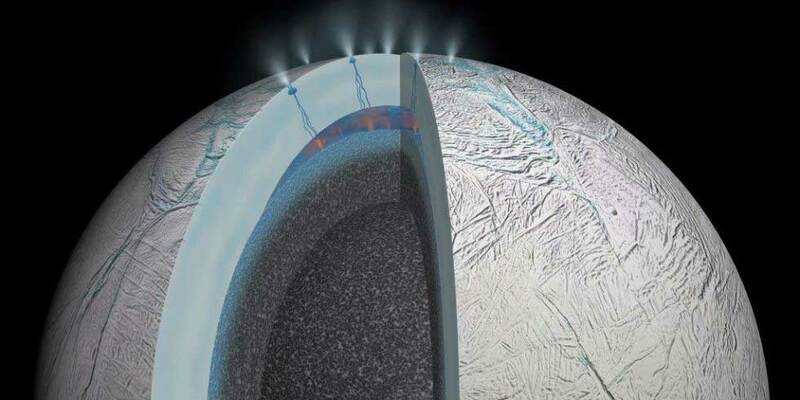 This is not a new finding as it was already known that the moon contained water, however, with the help of NASA’s spacecraft Cassini, researchers were able to confirm the presence of ice and steam on Enceladus’ South Pole. In 2004, the Cassini reached Saturn and over the years it has been performing a deep study on the planet and its moons’ characteristics. Researchers used seven years of data collected by the Cassini mission and determined there is indeed a global ocean between the moon’s icy crust and its rocky core. “This was a hard problem that required years of observations, and calculations involving a diverse collection of disciplines, but we are confident we finally got it right,” said Peter Thomas, a Cassini imaging team member at Cornell University and lead author of a paper published in the journal Icarus, in a statement. After analyzing the seven year’s worth of images of Saturn’s moon, Thomas and colleagues compared 5,800 crates and other topographic features shown in the images. They figure that if the moon was completely frozen from its interior to its outer surface, its wobble would look much smaller while on movement. But since its motion is more observable, scientists concluded that Enceladus is not fully frozen. What’s most interesting is that plumes of water vapor, icy particles and organic molecules, which are the basic ingredients that support life, were observed in Enceladus’ south pole. The presence of these materials on the moon has extended the possibility of potentially habitable zones in the solar system. “A global ocean, versus a regional polar sea, might possibly be more likely to be habitable since it might cover more compositional or thermal effects from the core, and might even be longer-lived. However, we don’t know the first part, and we don’t know how old the ocean is,” Thomas added. Cassini is scheduled to take a close look on Enceladus on Oct. 28. It will be passing 30 miles over the surface and it will be the mission’s deepest dive into the moon’s oceanic plumes, until now. Enceladus is not the only one with an icy surface that contain ocean layers. Other moons such as Europa and Ganymede, which orbit Jupiter, also share this characteristic. At that location, Jupiter’s gigantic gravity along with the tugging and jostling of its satellites, aid to maintain the moons warm enough to keep fluid in its inside. As for Enceladus, it is still not clear how thick its inner ocean is, how the heat is produced, or why the layer at its south pole (and only its south pole) is thin enough for geysers to hit through. Scientists expect to obtain more data and information as the Cassini spacecraft will continue to study the Saturnian system until 2017, before descending into the giant ringed planet. The spacecraft’s next closeup of Enceladus will take place in October, and its last flyby is scheduled for December.